The owner of two Massachusetts auto body shops has been indicted on 42 charges after authorities say he used sledgehammers and mallets to further damage cars he was repairing in order to get higher insurance payouts. Authorities say the owner of two Massachusetts auto body shops has been charged with using sledgehammers and mallets to further damage cars he was repairing in order to get higher insurance payouts. Attorney General Maura Healey announced Monday that Adam Haddad, 42, of Shrewsbury, has been indicted on 42 charges, including 18 counts of insurance fraud. 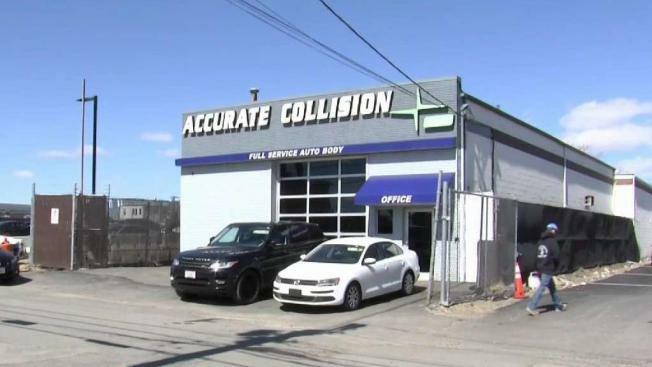 Authorities say Haddad owns Accurate Collision Inc. in Worcester and ADH Collision of Boston Inc. in Everett. ADH Collison was indicted on 10 charges of motor vehicle insurance fraud and eight counts of larceny by false pretenses. Accurate Collision Inc. was indicted on eight counts motor vehicle insurance fraud and seven counts of larceny by false pretenses. An investigation began in 2017 after a referral from the Insurance Fraud Bureau. The attorney general says surveillance footage from one those locations showed Haddad using mallets, sledgehammers, and pieces of wood to intentionally damage to five customers' vehicles to inflate appraisal repair quotes. He would then allegedly pocket the insurance payout and not complete repairs. The attorney general's office alleges Haddad stole more than $170,000 from 11 different insurance companies. The investigation is ongoing. Anyone who thinks they may have been victimized is urged to contact the Attorney General’s Office Insurance Fraud Tip Line at 617-573-5330. Haddad is expected to be arraigned in Middlesex and Worcester county courtrooms at later dates. It's unclear if he has an attorney.